Congratulations to Lakeland Hyundai for receiving the Dealer Rater 2017 Consumer Satisfaction Award. #LakelandHyundai #DealerRater #Reviews Thanks to a wonderful team who work hard to make sure we are exceeding customer expectations every day! 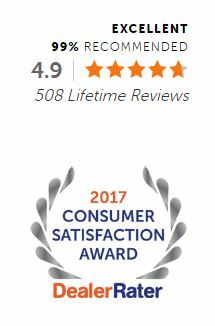 It’s nice to be recognized by the industry for success and Lakeland Hyundai is proud to be one of the winners of the 2017 Consumer Satisfaction Award. Thanks to all of the team members at Lakeland Hyundai for helping to make this happen. Come to Lakeland Hyundai for a fantastic car buying experience. The Lakeland Promise gives you 100-percent transparent pricing, a best price guarantee, our vehicle exchange program, a nationwide limited warranty, a year of free maintenance, and much more. We do things differently here. So when you are shopping for a new Hyundai in Lakeland, make sure you come to Lakeland Hyundai. Our impressive state-of-the-art facilities include a children’s play area, FRESCOS café, and free Wi-Fi. But it’s our premier customer service that really stands out! Visit Lakeland Hyundai today! Lakeland Hyundai has an amazing selection of new Hyundai models for sale in Lakeland, FL. Visit us today or shop online to see the new Hyundai Elantra, Sonata, Tucson, Santa Fe Sport, and more. View our online inventory of new Hyundai vehicles to see lots of details about any new Hyundai that interests you! Shopping for a used car is easy at Lakeland Hyundai. That’s because we offer a massive inventory of top quality used vehicles from famed automotive brands. If you need a used crossover, SUV, wagon, sedan, coupe, minivan, or pickup truck, view our inventory of used cars online or visit our used car department. Getting a car loan for a new Hyundai is simple; just talk to one of our finance managers. You can even start the process of financing a new vehicle on our website when you submit our secure auto loan application. You can also use our handy credit score estimator to see what your credit score is before you apply for an auto loan on our site. Your Hyundai needs service to keep running in prime condition. So bring it to the service department at Lakeland Hyundai for all auto repairs and scheduled maintenance. If you are a DIY-er in need of genuine Hyundai auto parts, you will find them in our Parts Department. You are invited to come to Lakeland Hyundai today to test drive a new Sonata, Azera, Santa Fe, or any other new Hyundai in stock. Contact us now to schedule your test drive or come in and see one of our sales representatives. We’re always happy to help!